As expected, Oculus has finally revealed that they'll be bringing a new virtual reality headset to market soon. The device, called Rift S, has been developed, somewhat surprisingly, with the help of Lenovo. Rift S is a more mobile headset that integrates new environment sensing cameras which means that there's no need for external motion sensing cameras. However, to keep the price down they've had to make some compromises compared to previous Rift headset. While the resolution has gone to 1280 x 1440 from 1080 x 1200, the refresh rate is actually lower at 80hz (was 90hz) and OLED panels have been changed to less impressive LCD technology. There's no setting for the optics either, so you won't be able to change the distance of the lenses to your specific needs. The headphones are also a downgrade to what Oculus uses in it's cheapest Go headset, which are near-ear speakers. There are other slight changes too which TechCrunch has listed nicely. 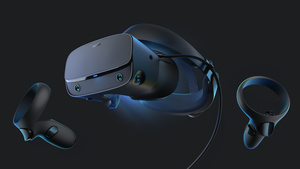 Oculus has confirmed the price at $399 and they should become available some time this spring.